A worldwide LE, Sommelier Teddy Bear comes with his own private label wine bottle. New in 2015, and looking very dapper in his vest and bow tie, Sommelier Teddy Bear is a gorgeous burgundy alpaca and stands about 14 1/2 inches tall. Made in Germany, he's a world wide exclusive of only 1500 pieces. 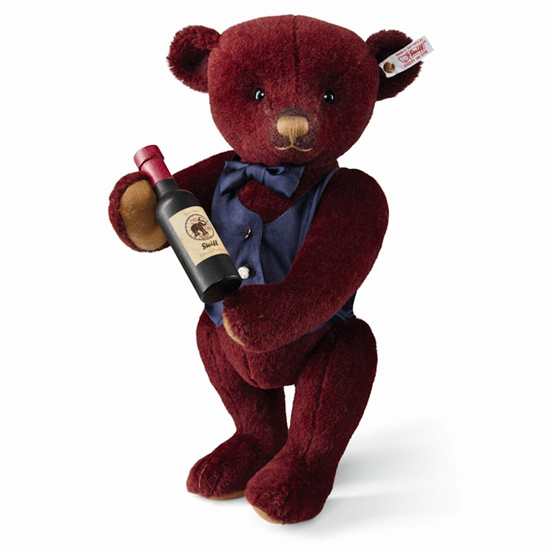 Sommelier Teddy is 5-way jointed, and comes with his own private label bottle of wine! He is not a toy but rather a fine adult collectible.